longexposure.net » Blog Archive » Skeletonised: Back to the Rusty Car! Skeletonised: Back to the Rusty Car! 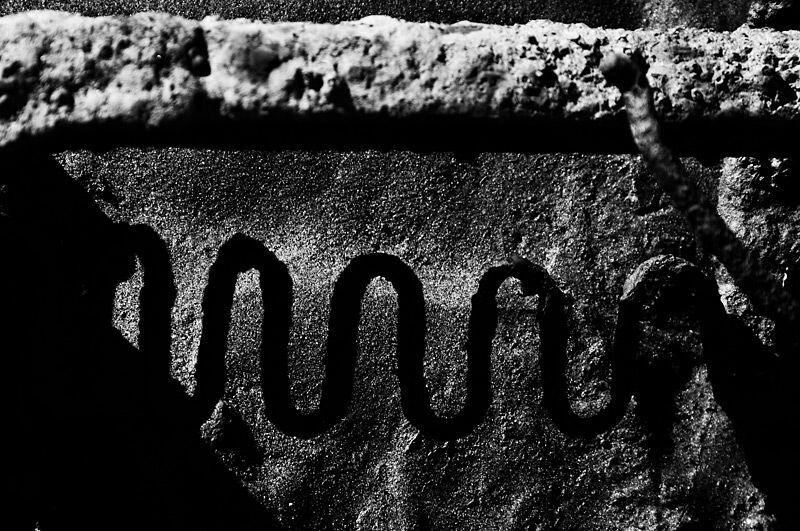 It’s been nine months since I last visited the rusty car of the Pinkenba foreshore, nine months of corroding remnants being swallowed by tides and baked by the sun. Being in the area for work, I checked Exposerator for the tide times; the levels were good, so I decided to detour out to the car, and see how it was looking. Certainly the area around the car has changed – what were overgrown grassy fields populated by rusty metal are now becoming warehouses and industrial facilities. Even the road to the foreshore has been moved, the previous track being swallowed by development. There’s no longer a sense of isolation down there – in all directions there’s construction and activity, and I doubt that anyone will ever visit for the seclusion again. So – the car. In the best part of a year, it hasn’t changed all that much. While the initial decay was rapid and vigorous, what’s left at this stage is taking some time to disintegrate. 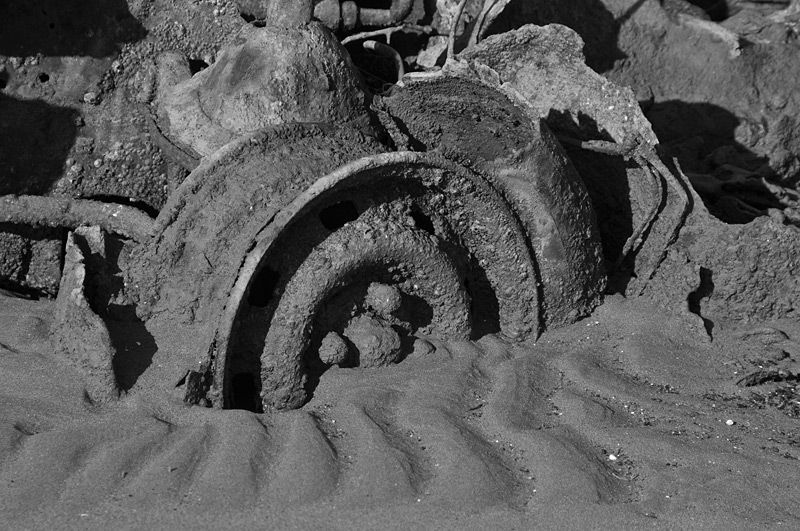 Rusting components are starting to lose their shape a little, as they expand and flake, and the whole thing is slowly being drawn into the sand, but nobody would yet mistake it for anything other than what it is. I happened to have a camera with me, but I had chosen to take a particularly poor lens, one which I practically never use, and have been meaning to sell. Actually, I put it up for sale on a web forum recently, but it’s not something that’s in great demand. Now, I should clarify, and say that it’s not the individual lens that’s the issue, or even the model or design, but the fact that it’s just a cheap lens that doesn’t really compare to anything a little more upmarket. It does have a wide focal range, though, which is why I’d decided to give it a try. One day, the car will just be fragments scattered along the shore, or dragged into the channel. I’ll return sometime before that, though, and see how things are progressing. 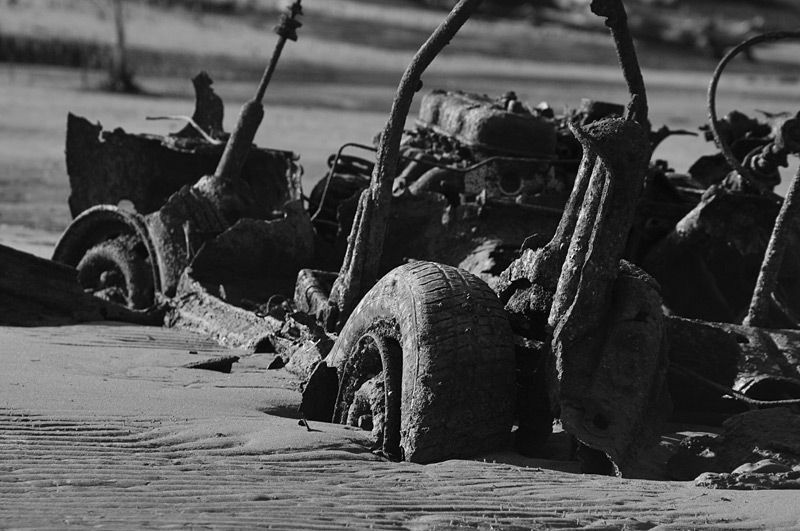 That first one looks like a bogged or really muddy dune buggy. I really like the subject angle in that one, far better than the latter ones. The last one kind of looks like the a skeleton of the car with calcification of its “bones”. I agree, that last shot is quite woeful, from a photographic point of view :) I was surprised that the seat frames were still there, and still upright – surely they can’t hold on forever? I love the way the steering wheel is suspended in mid-air. I’d expected that to be gone by now. It slipped the surly bonds of earth to touch the face of God. And yes the top shot is by far and away the best.